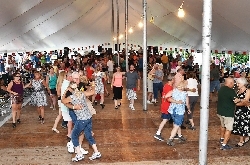 IN PRAISE OF POLKA MUSIC « THE BRYCE IS RIGHT! As I was growing up, I didn’t think too much of the polka, that festive music originating from Europe. I was exposed to it in Chicago where I lived for a few years. Even then I thought it was nothing more than a curiosity and not a serious form of music. More recently though, a polka show surfaced on WZIG-FM (104.1) here in Palm Harbor where my audio columns are played (click to STREAM). At first, I tuned in just to listen to something different as I drove around locally, but I quickly became a fan of it. Let me explain why. First, the “Polka Happy Hour” is played on Wednesday’s from 5-6pm with “Wackie Jackie” as the host. Aside from the silly name, he is a polka aficionado who explains what the various songs mean and how they originated. He is a veritable encyclopedia of polka knowledge who obviously enjoys the music genre and turns it into an enjoyable hour of entertainment. Some people might say to me, “What, you listen to polka? Are you crazy?” Probably so, but I became attracted to it as it is lively fun, as opposed to the Rap rubbish on the radio. There is relatively few polkas well known by the general public, such as the Pennsylvania Polka, the Beer Barrel Polka, and She’s Too Fat Polka. As to this last one, people who are politically correct may be offended as it talks about a woman who is overweight. There are many others the PC police would be bothered by the message of the song. Those who enjoy polka though, know it is only done in jest and are not offended in the slightest way. As an aside, a personal favorite of mine is, “You Cannot Teach the Japanese to Polka.” I do not believe our friends from the land of the rising sun would object to this, and would likely agree with the premise. Like everyone else, they would laugh. Polka is fast paced, fun, and frankly, a little frivolous. If you haven’t listened to it in a while, give it another try. I don’t believe you can wear a frown while listening to polka music. No doubt, there would be less stress in the world if there was more polka.